National Transportation Safety Committee investigator Nurcahyo Utomo during a press conference on the committee's preliminary findings on their investigation on the Lion Air crash, in Jakarta, Nov. 28, 2018. Indonesian officials say search crews have found and recovered the cockpit voice recorder from the Lion Air jetliner that crashed in the Java Sea last October, killing all 189 passengers and crew on board. Navy divers recovered the device Monday, just days after search crews detected a weak signal from the recorder, which was buried under several meters of sea bed mud. Both naval and civilian officials associated with the search and recovery effort say human remains were also discovered near voice recorder. The discovery of the second of the two so-called "black boxes" could provide additional information as to why the Boeing 737 MAX 8 jet went down shortly after takeoff on a flight from Jakarta to nearby Bangka-Belitung island. The plane's flight data recorder was recovered days after the crash. 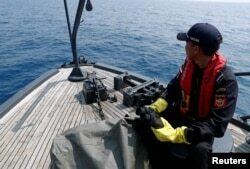 FILE - Indonesian customs officers patrol at a search area for Lion Air flight JT610 in Karawang waters, Indonesia, Nov. 1, 2018. Investigators with Indonesia’s National Transport Safety Committee issued a preliminary report in November, that based on information gained from the flight data recorder the plane’s automatic safety system repeatedly pushed the plane’s nose downward, despite the pilots’ desperate attempts to maintain control. They believe the automated system that prevents the plane from stalling if it flies too high on Boeing's new version of its legendary passenger jet received faulty information from sensors on the fuselage. The plane had a similar problem on a flight from the resort island of Bali to Jakarta the night before the fatal crash. The investigators said the plane was not airworthy and should have been grounded after that flight. The crash is the first involving the new fuel-efficient Boeing 737 MAX 8 jetliners, and another black mark on Indonesia's fast-growing aviation sector, which has acquired a reputation for poor safety oversight. The country's airlines have previously been banned from operating in the United States and European Union.